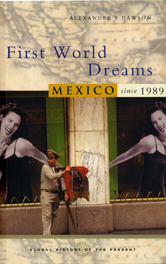 Mexicans have long dreamt of the First World, and in recent times it has landed there with a thud. Under the guise of globalization, Mexico opened its borders, reformed its political system, and transformed its economy. The impacts have been paradoxical. A vibrant civil society is marred by human rights abuses and violent rebellion. Market reforms have produced a stable economy, economic growth and great fortunes, while devastating much of the countryside and crippling domestic producers. Mexico is today one of the world's largest exporting nations, yet has a perpetually negative trade balance. It is a country in a perpetual state of becoming; a modern industrial democracy where human rights are respected - and a violent, fragmented place where the chasms of wealth and poverty threaten to undo the dreams of modernity.